This page contains pictures and information about the Potter Wasps and Paper Wasps in family Vespidae that we found in the Brisbane area, Queensland, Australia. Wasps in this family are from medium to large IN size. They can be recognized by the inner margins of their compound eyes strongly emarginated. The pronotum is shortened medially which form a "V" shape on the thorax. When rest, the forewings often folded longitudinally. All the social wasps are in this wasp family, although some other members are solitary wasps. Some of them build paper nest while others build mud nest. They provision the young with caterpillars. 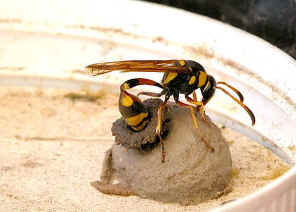 There are three Australian subfamily, the Eumeninae, Masarinae and Polistinae in this wasps family Vespidae. Masarinae species feed their young with nectar and pollen. They are rare in Brisbane and we did not find any yet. 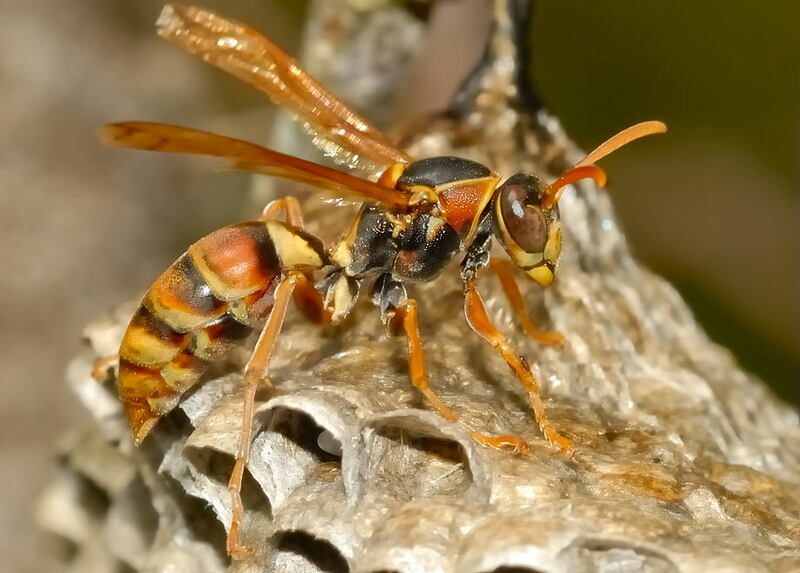 Potter Wasps build mud nest with jug shape. They are solitary wasps. They are common around Brisbane. Pollen wasps are solitary wasps and bee like. They provision their larvae with pollen and nectar. They are not common in Brisbane. 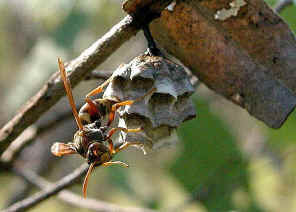 Paper Nesting Wasps build wide cone shape nest hanging with single stalk. They are social wasps living in colonies in a nest built of "paper". They are common in Brisbane. 1. Insects of Australia, CSIRO, Division of Entomology, Melbourne University Press, 2nd Edition 1991, pp 979. 2. Insects of Australia and New Zealand - R. J. Tillyard, Angus & Robertson, Ltd, Sydney, 1926, p295. 3. What wasp is that? - An interactive identification guide to the Australasian families of Hymenoptera, 2007. 5. Family VESPIDAE Potter Wasps, Social Wasps - Australian Faunal Directory, Australian Biological Resources Study.